The roofing underlayment is an essential part of every modern roof construction. It has a protective function and contributes to a good energy performance of the house. In this article, we will discuss the function of the roof underlayment and the different types of roofing underlay. What is a roofing underlay? The roof underlayment serves as a protective layer between the roof covering and the insulation material. It protects the insulation material and the underlying construction against penetrating damp, dust and wind. A roof underlayment is not to be confused with a vapour barrier. This comparison is completely unjustified, as these materials protect the insulation material in a whole different way. The vapour barrier blocks vapour from the inside of the house (the warm side of the insulation), whereas the roof underlayment blocks damp from the cold side (like snow and rain water). Nevertheless, vapour can still get through the roof underlayment. Damp that is still inside of the insulation material, can therefore still vaporise. Which conditions should a good roof underlay live up to? A small amount of water (due to snow or a defect roof tile) can still penetrate the roofing, which is why a roof underlayment is required. Most roof underlayment materials are able to drain this amount of water correctly to the roof gutter. About 2% of the total amount of water on the roof can be stopped by means of rigid roof underlayment boards. If more water manages to get through the roofing, leaks will still occur. In order to limit energy losses as much as possible, airtightness is one of the most important points of concern regarding thermal insulation. Since still wind is a good insulator, it is important to protect roofing underlays against wind. Moreover, the heat in the house should not be able to escape through air leaks. The vapour barrier has an important role to play here; it can complement the function of the roof underlayment. When the roof underlayment is being applied, one has to make sure that the material connects well. A good roof underlayment must be water- and windproof but vapour-permeable. Damp inside of the insulation should be able to get out and vaporise. Otherwise, the insulation material becomes damp and the insulation capacity would diminish. Moulds may start to occur as well, which is very undesirable. This is why roofing underlayment should exist of a good vapour-permeable foil or vapour-permeable sheet material. Do you want to have a roof underlayment installed by a professional roofer? On our quote page, you can request free and non-binding price quotes from different professionals in your region. Click here to receive quotes. Various types of materials can function as a roof underlayment. Generally, we can distinguish between two categories: foils and sheet material (half-rigid and rigid roofing underlay boards). Usually, roof underlayment foils are made of polyethylene, polyester or polypropylene. In order to foster the strength of the foil, synthetic fibres are often added to the material. It is also possible to provide foils with an extra reinforcement layer, which significantly lowers the risk of tears in the material. A proper roof underlayment foil is micro-perforated and therefore vapour-permeable. + Advantages of roof underlayment foil: favourable price, easy to apply, easy to transport. – Disadvantages of roofing underlay foil: risk of perforation (or tears), cannot be applied as tight as rigid boards. Semi-rigid boards are mostly made of synthetic materials (a combination of polypropylene and polyethylene). They can be micro-perforated at one or both sides. So, alike roof underlayment foils, these sheets are very vapour-permeable. + Advantages: solid, cheaper than rigid insulation boards, insulating properties, light material, easy to install. – Disadvantages: these boards may sag during the application of insulation from the inside. Fibre cement boards are made of plastic fibres, natural fibres and Portland cement. The boards are strong, have a good vapour permeability and a very long life span. The sheets overlap when they are installed; the lower the roof slope, the bigger the overlap. Lateral seams are sealed with a special tape. + Advantages: strong (no perforations or cracks), good vapour permeability, cheaper than wood fibre boards, already applicable on roof slopes from 5° onwards, can be exposed to rain and wind up to 1 month (in case of renovation). – Disadvantages: they do not insulate as well as wood fibre boards, more expensive than roof underlayment foil. The main component of wood fibre boards are wood fibres, originating from sawing waste (fabrics, sawmills, etc). Depending on the type of wood fibre boards, substances like bitumen, latex, paraffin or polyurethane glue can be added. Generally, wood fibre board has a tongue and groove joint. The joints do not have to be sealed, since the material has natural shrinkage- and expansion abilities. + Advantages: environmentally friendly, recyclable, good heat storage capacity, high vapour permeability, can be exposed to wind and rain during 3 to 12 months (in case of renovation). 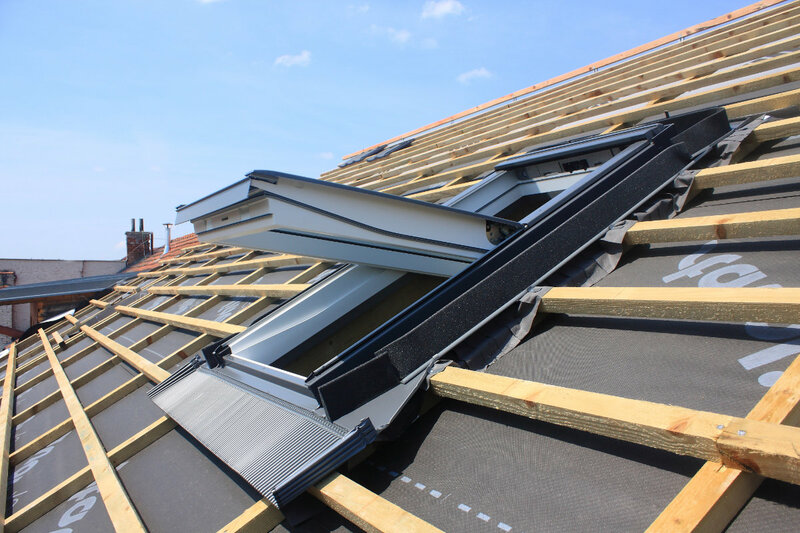 – Disadvantages: more expensive than foil or plastic boards, only fit for roof slopes of at least 15° (otherwise, an extra foil is required for waterproofness). 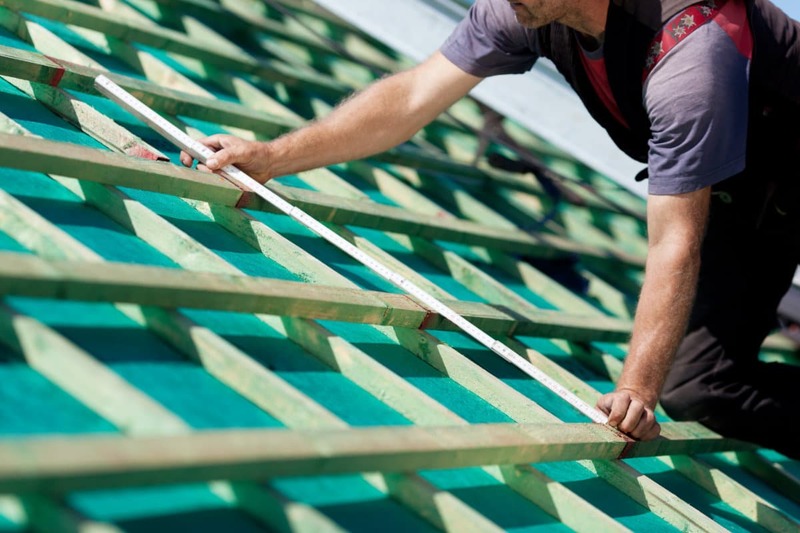 The cost for installing a roof underlayment depends, amongst others, on the chosen material, the accessibility and the total surface of the roof. On average, the material will cost £10-£15 per square metre. Keep in mind that the installation by a professional roofer entails extra costs. However, it is always recommended to leave the installation to a professional. Are you looking for a craftsman to install a roofing underlay? 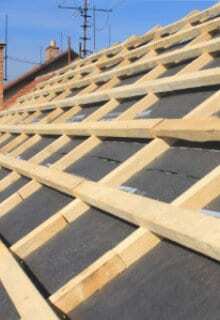 On our quote page, you can request customised price offers from professional roofers. This service is free and noncommittal. Click here to go to the quote page.